The Mets salvaged the final game of their series with the Braves Sunday, dealing Atlanta its first loss of the season. 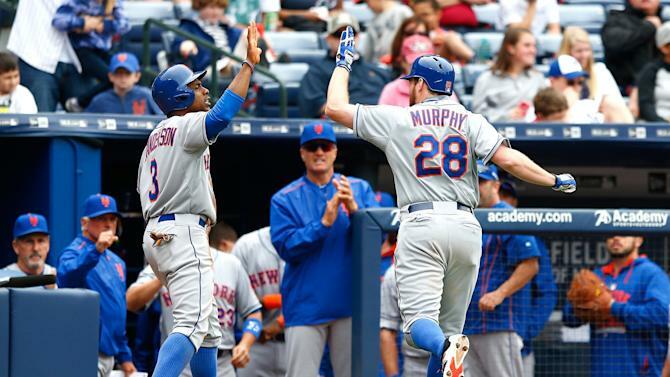 Daniel Murphy gets the high-five after game-winning RBI. Michael Cuddyer got the Mets off to a fast start with his first home run of the season, a two-run shot in the first inning. But the Braves tied the game in the second, and once again shoddy fielding was to blame. With one out and a man on first, Bartolo Colon got Jonny Gomes to hit a double-play grounder to second. But Ruben Tejada underhanded the ball to WIlmer Flores, and Flores took too long to make the relay throw, and Gomes was safe at first. So instead of the inning, being over, Colon had to continue. He allowed a single and then a triple to Andrelton Simmons to make it a 2-2 game. Colon took it upon himself to break the tie. With Flores on third in the fourth inning, Colon dropped an ungraceful single to right and the Mets had a 3-2 lead. It was his first RBI in a decade! But Colon gave the run back in the seventh when Gomes homered to left and once again we were tied. The Braves bullpen, which had not allowed a run all season, broke that streak in the eighth. Juan Jamie walked the bases loaded (the last was intentional after a sacrifice bunt) and then Andrew McKirahan, making his major league debut in a tough situation, allowed a sacrifice fly to pinch hitter Daniel Murphy to give the Mets a 4-3 lead. Jerry Blevins, who finished the eighth, started the ninth and got the first out. Closer Jeurys Familia came on to get the final two outs and close out the game.